Video of the talk will be posted here as soon as it’s available. Until then, read through the slides above and follow the links for more information on this transformational CSS module. Header photo by Mark Sallman. I just watched the recording of your WCEU talk on CSS Grids. One word: Inspiring. Hats off to you for a very captivating talk. 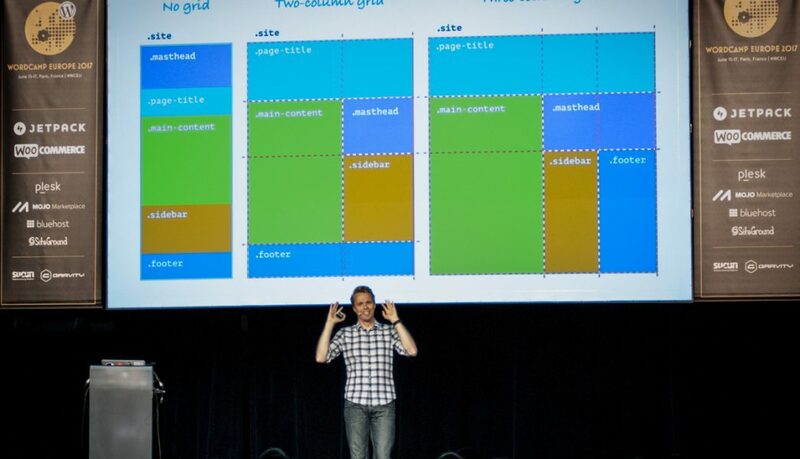 The way you explained all the details about CSS Grid was clear. Even though I am not a designer by trade, I am excited to try this out. Your presentation skills are top notch! Many thanks for asking and answering that question about whether the Frameworks will adopt the CSS Grid. Primarily, I work with ecommerce sites, so I can see how the CSS Grid makes things much easier with less work. I currently use Genesis. I am not too sure whether or not they do/will support CSS Grid in the near future. Thank you Amit. My guess is Genesis will get on board quickly. As for the true CSS frameworks, I hear Foundation is working on something. We will just have to wait and see. I have a question. I am just beginning to learn CSS with the goal to completely re-code my hobby website to a RWD. I desktop site was a boiler plate design so I didn’t code the CSS part. If i am just beginning the learning CSS part, should I start with traditional CSS or try to understand the grid components? What would be the best learning path with this goal in mind. Hi, I found only today your presentation on YT (https://www.youtube.com/watch?v=7kVeCqQCxlk). First of all… AWESOME! I start just now to change my way of make it, finally! From the first words… is so.. why we have to do these… hacks always to respect the design! So excited, and start to spreading to all collegues and friends. Btw… for single elements like a styled button (that before was in charge to bootstrap, foundation…) what is your approach? In you experience using CSS grid? I just want to say I think css grid is awesome.